Living in Tulsa, OK for 11 years, I asked the locals if crime was a problem. They replied, “well, in August you better be sure to lock your car, because otherwise someone might put a bag of zucchini in your car.” 🙂 People who grow zucchini, like me, harvest more than we can eat. Zucchini, otherwise called summer squash, is a member of the gourd family. It originated from Central America from where it has spread to the rest of the world. This popular succulent vegetable does well in warm weather, in places with moist, fertile soil. It takes 35 to 60 days from planting to first harvest. The plant grows to a height of two and a half feet. For best flavor, zucchini fruits are harvested when they are 4-8 inches. Darker fruits are usually higher in nutrients. 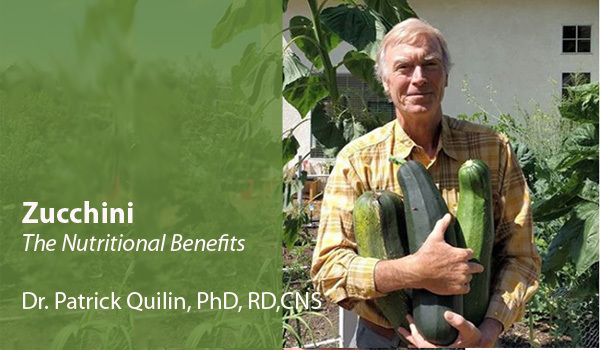 But what are the nutritional benefits of zucchini? What are the nutritional benefits of zucchini? Zucchini contains zero fat, is high in water and fiber. It also contains significant amounts of vitamins B6, riboflavin, folate, C, and K, and minerals like potassium and manganese. The summer squash also contains antioxidant and anti-inflammatory phytonutrients. This makes zucchini, also known as courgette, a nutrient dense food that you should include in your diet. Aging results from the activity of toxins, free radicals and inflammation that the body is exposed to over the years. These poisons and inflammation can be reduced by antioxidants and anti-inflammatory foods. Zucchini is rich in antioxidants and anti-inflammatory phytonutrients which help to rid the body of free radicals and excess inflammation. High blood sugar levels and diabetes are problems that are worsened by a diet high in carbohydrates and low in fiber. By including zucchini in your diet, you increase the intake of fiber. You can also reduce your carbohydrate intake because you will feel full for longer. These diet changes can help reduce your blood sugar levels and increase insulin sensitivity. This can mean that your body no longer requires excessive amounts of insulin to process sugar. This can change your risk of developing diabetes. Studies show that including at least 30 grams of fiber in your daily diet lowers your risk of getting diabetes significantly. Because zucchini is a rich source of B-vitamins, especially folate, riboflavin and B6, it can help to boost energy production in the body. This reduces fatigue and improves moods. The body requires B-vitamins for protein and carbohydrate metabolism. The vitamins also aid in various brain functions including cognition. Because zucchini is low in calories and high in water and fiber, it is a great food for those wishing to reduce their body weight. It is worth to note that excess body weight usually results from regular consumption of carbohydrate and sugary foods. By including zucchini in your diet, you increase the fiber and water content of your food. This means that you will feel full for longer and end up eating less. In the long term, you will lose some of your excess weight. Zucchini contains high amounts of vitamin C and polyphenols, especially in the peels. Laboratory studies on rats by the Devi University found that the compounds in zucchini peels have positive effects on the thyroid and adrenal glands. Additionally, the compounds helped in the regulating insulin levels. Zucchini is rich in antioxidants and anti-inflammatory compounds including vitamins A and C, glutathione peroxidase and superoxide dismutase. Large amounts of these compounds are found in zucchini skin. For this reason, you should eat the skin together with the flesh. Eating zucchini regularly reduces oxidation and inflammation within the body. This boosts your immunity and protects against diseases associated with inflammation. Zucchini grows best during the warmer months which us the reason it is also called summer squash. However, you can still grow it at other times provided it is shielded from extreme cold. If you get your system down, zucchini plants can become extremely productive with fruits. Prepare the growing area by digging to loosen the soil. Create mounds of about 2-feet diameter, up to 10 inches high and about 4 feet apart. Plant 6 seeds per mound, spacing them evenly. Cover each seed with soil no deeper than 1 inch and water them thoroughly. Thereafter, water your zucchini seeds once or twice a week depending on the weather. Once the seedlings emerge, wait until the healthiest are about 3 inches tall. Weed out the weaker ones, leaving two or three in each mound. Continue watering as needed, aiming to get the water near the roots. When your zucchini start flowering, you may need to add fertilizer to support growth of the fruits. Also water more often, especially if the weather is hot. Zucchini takes about 60 days from planting to harvesting. Harvest zucchini as you need them when they are about 6 inches long. Fruits taste best at this stage. If you let them to grow for too long, they start getting woody and won’t taste too good. Enjoy your home grown zucchini raw or cooked. Slice your zucchini in cross sections, like small steaks, then apply a thin coating of olive or avocado oil, then sprinkle your favorite seasoning, like Lawry’s, then grill on the BBQ for 7 minutes on each side. Or, if you tolerate dairy well, then make a pizza out of your zucchini by adding a big slice of tomato on top, then a layer of your favorite cheese, then bake in the oven at 350 F for 15 minutes. ← What is a Himalayan Salt Lamp? Thanks Darlene. Glad it was beneficial. Valuable presentation! I do not use this vegetable enough. Thanks, also for growing details. Another vegetable with tremendous health benefits. They are very easy to grow!